We are lucky to count among our friends the cocktail expert Maggie Hoffman. Everyone should have a cocktail expert in their circle, don't you think? But really, if you can, get Maggie. More on that in a moment. 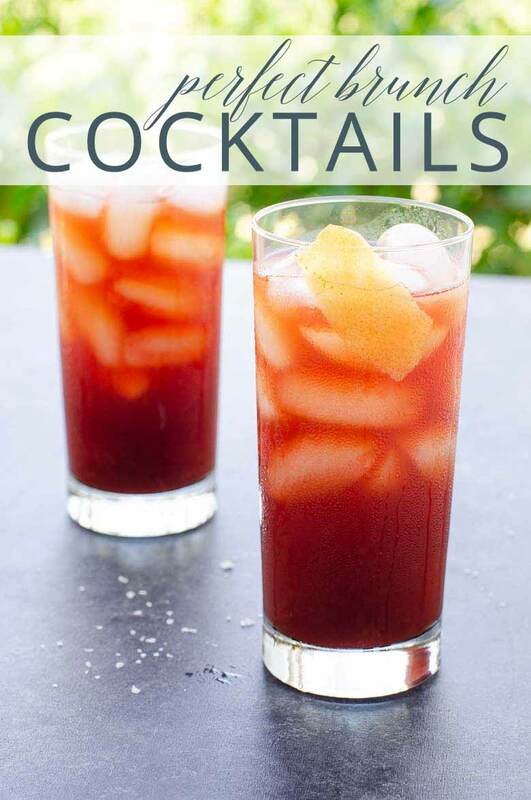 In the meantime, please allow us to ply you with a truly delightful brunch cocktail featured in Maggie’s latest book. The Grand Prix was created by Morgan Schick for Villon, a restaurant and lounge in San Francisco’s Proper Hotel. 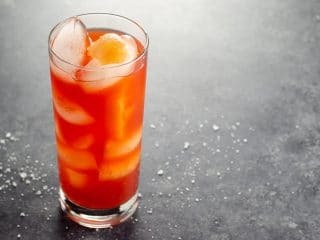 The Grand Prix, which magically blends Campari, cold brew coffee, and fresh grapefruit juice, is very light in alcohol content and perfectly balanced in flavor, with fruity, bitter, tart, and roasty notes. Truth be told, given all the time in the world, I would never have thought to mix those ingredients together. This is why we need cocktail experts. And you already know we need brunch cocktails. 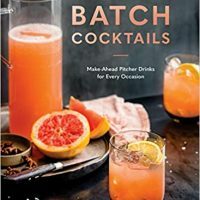 Grab a copy of Batch Cocktails: Make-Ahead Pitcher Drinks for Every Occasion today. You'll be glad. Though Maggie and I share an undergraduate alma mater, I am…how do you say?…slightly too old to have met her there. Instead, we met as fledgling NYC-area food bloggers a decade ago, and then Maggie went on to become my editor at Serious Eats, where she founded the Drinks section. 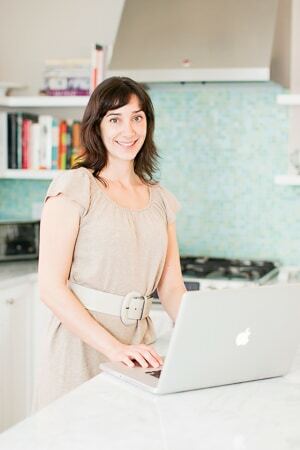 She now writes about bars and cocktails for publications including Food & Wine, Sunset, Wine Enthusiast, and the San Francisco Chronicle. 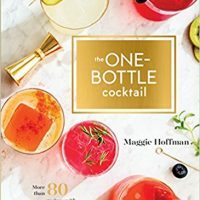 Even better, she’s the author of two books that both bring sophisticated cocktail recipes and techniques into the realm of non-experts. We love both of these books, and, since we love to entertain but don’t love chaos, we especially appreciate her most recent book, Batch Cocktails. At its heart, this book gets you. It knows you want to throw a great party with a signature drink that your guests will want to make for their next party. And it really gets that sometimes making great drinks on the fly isn’t actually all that compatible with being a great host. These cocktails let you do most of the work ahead of time, and by the pitcher rather than glass by glass, so you can focus on spending time with your people. These drinks — and this book — sit in a sweet spot at the intersection of expertise, approachability, and appealing sophistication. The cocktails aren’t ones you’d come up with on your own, but they’re mostly very accessible, and all of the recipes we’ve tried have been excellent and meticulously tested. These aren't just cocktails you can batch. In many cases they're ones you should batch, for the sake of consistency, proper dilution, and temperature control, as Maggie suggests in this New York Times article. The book is organized by flavor profile and also indexed by season, occasion, and ingredients. And in case you weren't sold yet, it's worth the price of admission for the photos alone, thanks to the talented Kelly Puleio. This is one perfect brunch cocktail for spring and summer. 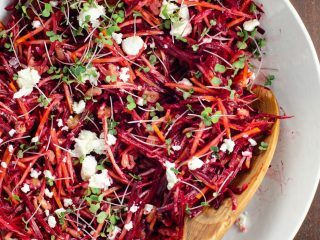 It's peak-level light and refreshing, yet has a lot going on under the surface. Campari and cold brewed coffee (who'da thought?) contribute a broad spectrum of delicious bitter flavors, grapefruit juice provides both tartness and fruitiness, and a generous splash of tonic takes the edge off the bitterness while fizzing things up a bit. After all these years, I'm pretty good at reading a recipe or a menu and understanding how the flavors will play out, but The Grand Prix involves a sort of alchemy that I had to taste to understand. It's extremely likable, but not in ways you'd predict by just looking at it. Kind of like my favorite brunch guests, actually. The Grand Prix is a light, beautifully balanced make-ahead brunch cocktail for a crowd created by Morgan Schick for Villon in San Francisco. The menu there notes, "Like the famous car race: Tall, red, cold, and bitter. Or is that like our ex-wife?" I don't race cars OR have an ex-wife, but I do very much love this cocktail. 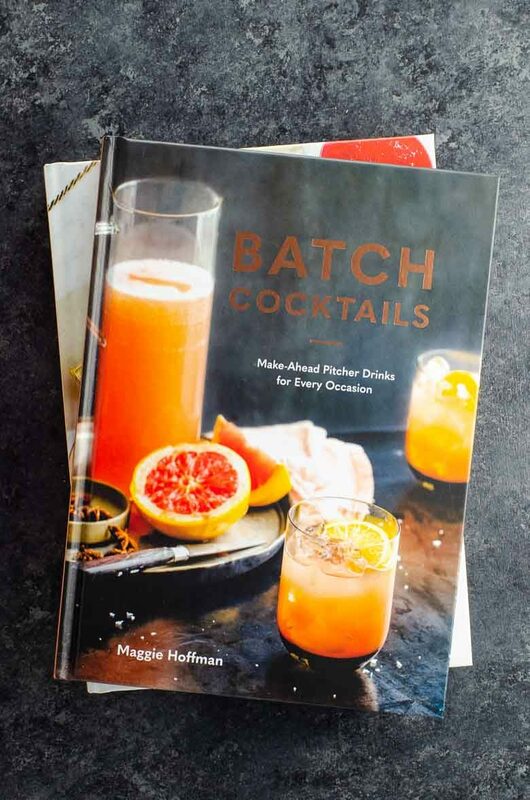 It comes to us via our friend Maggie Hoffman's new book Batch Cocktails: Make-Ahead Pitcher Drinks for Every Occasion. In a million years I wouldn't have thought to pair cold brew coffee with Campari and grapefruit juice, but boy, it just works. Up to 6 hours before serving, make the batch. Pour chilled Campari, chilled coffee, simple syrup, and salt into a 2-quart pitcher and stir to mix. Seal well, covering with plastic wrap if needed, and refrigerate. Up to 2 hours before serving, prepare grapefruit juice and stir into pitcher mix. Reseal and return to refrigerator if not serving immediately. To serve, whisk pitcher mixture well, or pour half of the mixture into a blender and blend for 20 seconds, then stir back into remaining pitcher mix. Fill 12-ounce highball glasses with ice and add 1/4 cup chilled tonic water to each glass. 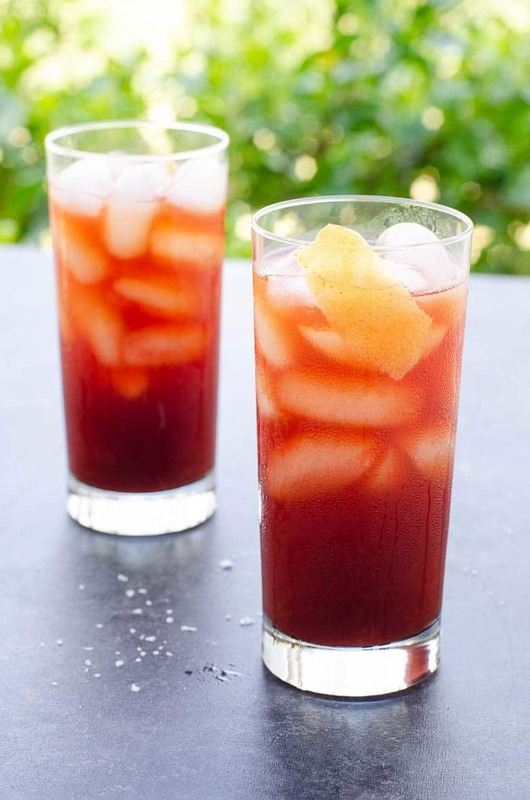 Top with pitcher mix and garnish each drink with a grapefruit twist. To make 2:1 simple syrup, combine 1/2 cup sugar with 1/4 cup water in a small pot. Cook, stirring frequently, until sugar is just dissolved. Don't allow the mixture to boil. Cool completely before using. Store any leftovers tightly sealed in the fridge for up to a month. Thank you, Ten Speed Press. Recipe ingredients and directions reprinted with permission from Batch Cocktails: Make-Ahead Pitcher Drinks for Every Occasion by Maggie Hoffman, copyright © 2019. Published by Ten Speed Press, an imprint of Penguin Random House.